Hope you take some time to check out these posts, and maybe even follow the blogs. You won't be disappointed! 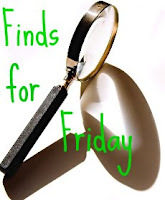 Thanks for sharing your finds. Sounds like some interesting ones.